Although The Adventures of Mark Twain is a Claymation extravaganza, it shouldn’t be thought of as just kids’ fare–in fact, much of the subject matter is not only intelligent on an adult level but also a bit dark. 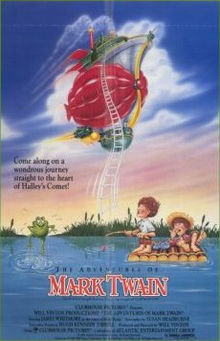 The premise is that three youngsters–Tom, Huck and Becky from The Adventures of Tom Sawyer–stow away on a fantastic lighter-than-air craft piloted by Mark Twain, who was born during a year when Halley’s Comet visited our atmosphere and is trying to join up with it during one of its return visits. As he puts it, the Lord noted that those two freaks of nature came in together, and they should go out together. Along the way, the kids start to question the outcome of the trip and plot to hijack the ship. They also encounter several of Twain’s short stories that are dramatized as subplots, a couple of which end up revealing crucial aspects of Twain’s own character. The Clamation effects are a knockout, highly imaginative, and the plot has more substance than you might think on first approaching it. You might want to view it with your youngest children, since there are some potentially frightening considerations of mortality. Overall, however, most viewers should find it highly entertaining. You got a very great website oregoncoastnews.tv , Glad I noticed it through yahoo.